Ian McLenahan, 4, studies a Madagascar hissing cockroachTuesday at an insects program for yongsters Tuesady at Earthplace in Westport. Creepy crawlies, roly polies, creatures with a thousand legs. They were all in the cast of characters that a small group of junior bug huggers met during a commune with nature Tuesday in Westport. 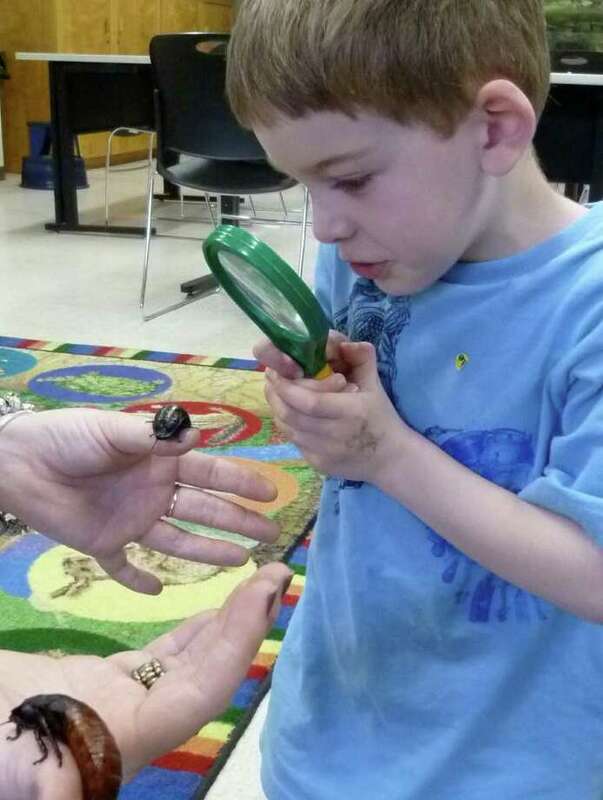 Led by naturalist Becky Newman, the "All About Insects" program at Earthplace Nature Discovery Center, introduced a half-dozen pre-schoolers to insects and related creatures from the area, as well as facts about their characteristics and activities. "Younger kids wanted a science-based program," said Newman, otherwise known as Miss Becky. "We're going to flip some rocks and find some bugs." "Will the bugs bite?" asked Fiona Lundell, 3, overhearing Newman. "Maybe I'll find a cute little beetle." Fiona's mom, Catherine, from Norwalk, said it was their first visit to the nature center. "My daughter loves bugs. I thought we'd give it a try," she said. A veteran of Earthplace activities, parent Leanne O'Hara of Norwalk said, "My kids love the programs here and Miss Becky. They love science in general. It opens up a whole new world to them." Newman led the children into the center's eco-lab, sat them on a rug, showed a model of a drone bee and posed questions to them. "Do you think insects see like we do? They have multiple little parts of their eyes, so they would see, like, eight of Ian," she said, referencing one of the children. "Do you know what they call their mouth? A proboscis, and it's like a straw. Swoooosh!" she said, making a sucking sound for effect. When she'd explained all the insect parts, Newman quizzed them to test their recall, then introduced a pair of Madagascar hissing cockroaches, from the Eco-Lab collection. "Hissing cockroaches taste with their feet," she explained, letting the large bugs roam across her fingers. "So she's tasting me right now. They have an exoskeleton, or bones on the outside. If you stepped on them, they'd go crunch, squish." Using laminated cutouts of insect parts, the group collaborated on creating a Frankenstein bug, then Newman armed them with magnifying glasses and large nets and led them outdoors to commence a bug hunt. It was a perfect day for the outing, with temperatures hovering at nearly 80 degrees. They stopped first at a fallen tree, to poke the bark, then brushed field grasses with a net, to try and snare bugs. They turned up a small cricket and ant, about which Newman peppered them with questions. Along a trail, they came to a rock and rolled it over. "There are some ants in there," Dolan announced. "Red ants!" the children cried. "Is an ant an insect?" Newman asked. "Yes," said Riley O'Hara, 4, recalling what he'd learned about an insect's defining characteristics. "Now, we found them under a rock," said Newman. "What should we do with the rock?" "Roll it back over, to respect their home," Riley brightly answered. They pressed on down a wood chip covered path, to a dead log, or "rotten log hotel" as Nweman called it. "See all the holes?" she asked. "They're made by termites and they're turning the wood into soil." Under another fallen log, they found a worm, inspiring another lesson. "Worms breathe through their skin," said Newman. "What do we use to breathe?" "Lungs!" came the cry. They continued in this way, gradually looping back to the main facility. "This is a nice intro to nature," commented Newman. "They may not retain a whole lot now, but it's the experience of being outside and treasuring everything the first time. It's funny, I can plan all kinds of things but it depends on how they go with it. In the end, they're learning something at every turn."